We will be building an API for a Blog CMS. The Blog will comprise of three concepts: Users, Posts and Tags. The CMS will handle creating and authenticating users (using JWT). Tags will be used as a taxonomy to group posts, think of it like categories in WordPress. A post can belong to many tags and a tag can have many posts. Authenticated users will be able to perform CRUD tasks like creating posts and tags. This tutorial assumes you already have some basic understanding of GraphQL. You might want to go over GraphQL docs as a refresher. We’ll go over each of package as we get to them. 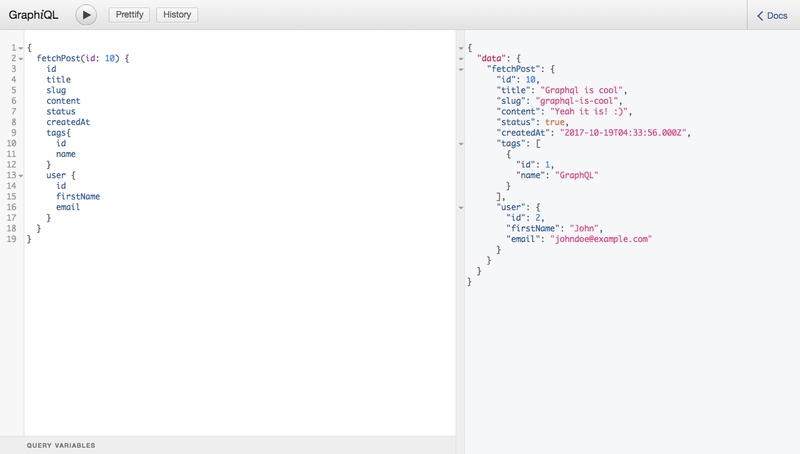 With the dependencies installed, let’s start fleshing out the app by creating a GraphQL server. We import our dependencies, express is the Node.js framework of choice for this tutorial. body-parser is used to parse incoming request body. graphqlExpress is the express implementation of Apollo server which will be used to power our GraphQL server. With graphiqlExpress, we will be able to use GraphiQL which is an in-browser IDE for exploring GraphQL (we’ll use this to test out the GraphQL API). 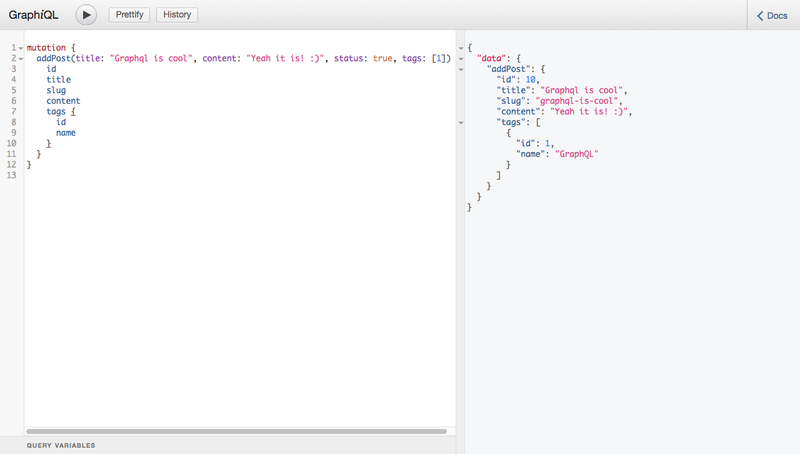 Lastly, we import our GraphQL schema which we’ll created shortly. We define a port that the server will listen on. We then create an express app. We define the route for our GraphQL API. We add body-parser middleware to the route. 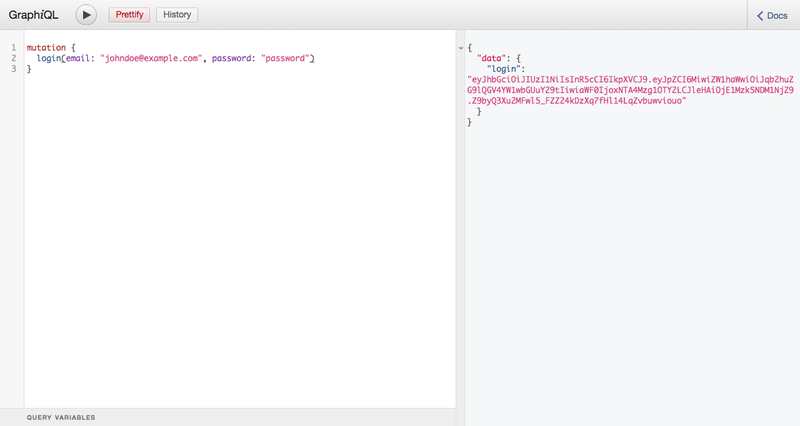 We also addgraphqlExpress passing along the GraphQL schema. Then we define the route for GraphiQL passing to it the GraphQL endpoint we created above. Finally, we start the server and listen on the port defined above. Let’s move on to defining our GraphQL schema. Schemas describe how data are shaped and what data on the server can be queried. GraphQL schemas are strongly typed, hence all the object defined in a schema must have types. Schemas can be of two types: Query and Mutation. We start off by pulling in graphql-tools, a package by the Apollo team. This package allows us to define our schema using the GraphQL schema language. We also import our resolvers which we’ll create shortly. We then begin to define the schema. We start by defining a custom scalar type called DateTime because Date is part of the types GraphQL support out of the box. So we need to define it ourselves. The DateTime will be used for the createdAt and updatedAt fields respectively. The createdAt and updatedAt fields will be auto generated at the point of creating our defined types. We define the User type. Its fields are pretty straightforward. Notice the posts field as it will be an array of all the posts a user has created. User and Post have a one-to-many relationship, that is, a user can have many posts and on the other hand, a post can only belong to one user. We then define the Post type. Its fields are pretty straightforward The user is a required field and represent the user that created a post. The tags field is an array of tags a post belongs to. Tag!! signifies that the array can not be empty. This means a post must belong to at least one tag. Post and Tag have a belongs-to-many relationship, that is, a post can belong to many tags and on the other hand, a tag can have many posts. Then we define the Tag type. Again, its fields are pretty straightforward. The posts field is an array of posts a tag has. Having defined our types, we move on to define the queries that can be performed on these types. allUsers will fetch all the users created and return them in an array. fetchUser(id: Int!) will fetch a user with a specified ID. We do the same for Post and Tag respectively. Next, we define some mutations. While queries are used for fetching data from the server, mutations are used to add/modify data on the server. We define a login mutation which takes email address and password as inputs. It is use to authenticate users. We also define mutations to create and update User, Post and Tag respectively. The update mutations in addition to the data, also accept the ID of the type (User, Post, Tag) we want to update. Lastly, we define mutations for deleting a Post and a Tag respectively. Finally, we use makeExecutableSchema to build the schema, passing to it our schema and the resolvers. models: contains all models for your project, also contains an index.js file which integrates all the models together. Update accordingly with your own database details. Now the CLI will be aware of our changes. With our database setup, now create our models and their corresponding migrations. For consistency, we want our models to mirror our GraphQL schema. So we are going to create 3 models (User, Post and Tag) with the corresponding fields we defined on our schema. We’ll be using the Sequelize CLI for this. Notice we define the relationship (one-to-many) between User and Post. We define the inverse relationship between Post and User. Also, we define the relationship (belongs-to-many) between Post and Tag. Also, we define the relationship (belongs-to-many)between Tag and Post. We need to define one more model/migration for the pivot table for the belongs-to-many relationship between Tag and Post. We start off by importing the necessary packages as well as our models. Because we’ll be defining a custom scalar DateTime type, we import GraphQLScalarType and kind. bcrypt will be used for hashing users password, jsonwebtoken will be used to generate a JSON Web Token (JWT) which will be used to authenticate users. slugify will be used to create slugs. We also import our models. Finally, import dotenv so we can read from our .env file. Let’s go over the mutations. login checks if a user with the email and password supplied exists in the database. We use bcrypt to compare the password supplied with the password hash generated while creating the user. If the user exist, we generate a JWT. 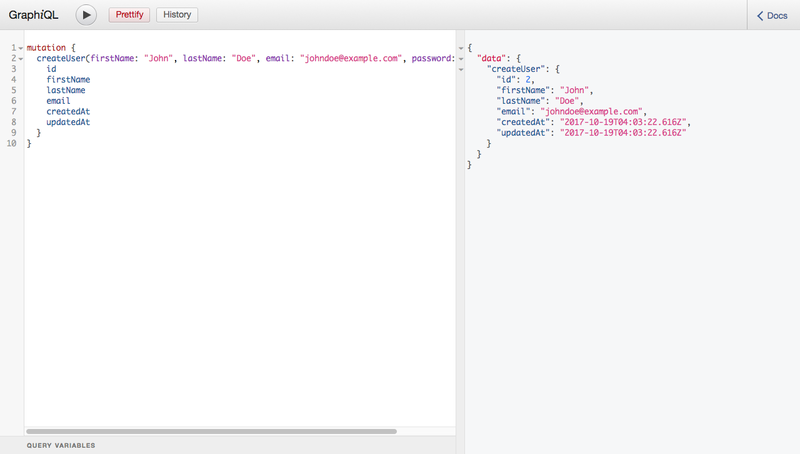 createUser simply adds a new user to the database with the data passed to it. As you can see we hash the user password with bcrypt. For the other mutations, we first check to make sure the user is actually logged in before allowing to go on and carry out the intended tasks. addPost and updatePost after adding/updating a post to the database uses setTags() to assign tags to the post. setTags() is available on the model due to the belongs-to-many relationship between Post and Tag. We also define resolvers to add, update and delete a tag respectively. These uses the methods (getPosts(), getUser(), getTags(), getPosts()) made available on the models due to the relationships we defined. We define our custom scalar DateTime type. parseValue() accepts a value from the client and convert it to a Date object which will be inserted into the database. serialize() also accepts a value, but this time value is coming from the database. The value converted to a Date object and a date in ISO format is returned to the client. We simply add the express-jwt middleware to the API route. This makes the route secured as it will check to see if there is an Authorization header with a JWT on the request before granting access to the route. We set credentialsRequired to false because we users to be able to at least login and register first. express-jwt adds the details of the authenticated user to the request body which we turn pass as context to graphqlExpress. You can see the JWT returned on successful login. For the purpose of testing out the other secured aspects of the API, we need to find a way to add the JWT generated above to the request headers. 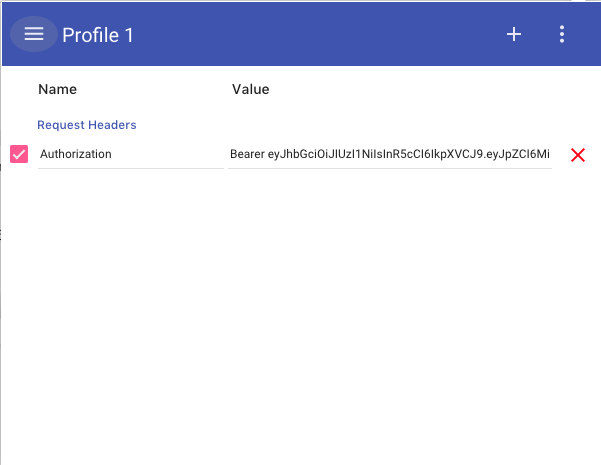 To do that, we’ll use a Chrome extension called ModHeader to modify the request headers and define the Authorization header. Once the Authorization header contains a JWT, this signifies that the user making the request is authenticated, hence will be able to carry out authenticated users only activities. We’ve established an API to power our own blog with GraphQL interface and can make authenticated calls to create and retrieve data, now what can you do? The complete code for our API is available on GitHub and can be used as a starting point. Check out Deploying Apollo GQL API to Zeit which shows how to take your local implementation of an API and making it accessible on the web using Zeit Now. Then read about pairing graphql fragments with UI components in GraphQL Fragments are the Best Match for UI Components and start building the interface of your blog.